Have you been involved in an automobile accident? If so, don’t wait to seek care, even if you believe your injuries are minor. 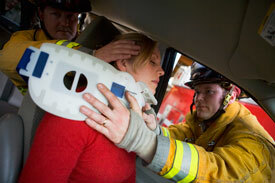 The stresses put on the body during a motor vehicle accident are typically much more severe than the average patient. The sooner you can begin care, the better chance you have of getting a proper diagnosis. Properly diagnosing problems early in the process can prevent problems from progressing and reduce the chances of permanent damage. Our staff will assist you in managing your case. We will evaluate your condition and help you coordinate your care. If you require a specialist or additional imaging, such as an MRI, we can get you the care you need. Contact our office today to discuss your options for care.